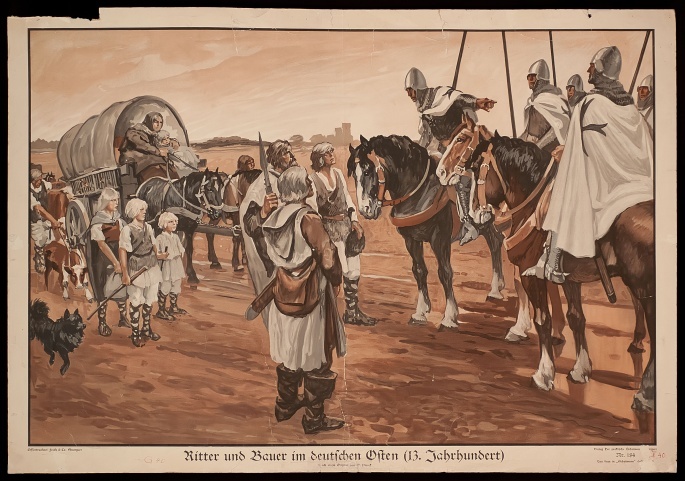 The picture shows a scene from the High Middle Ages (12th/ 13th century), when German rulers, knights, monks, peasants, citizens advanced into the East – some of them violently others called by christianized Slavic rulers. You can see people, most of them peasants, arriving at their new homelands and asking the Teutonic Knights for their settlement sites. The knights are wearing white cloaks with a black cross. The peasants who have all their belongings on a covered wagon are standing in front of them. Many of the settlers were attracted by low taxes, hereditary rights to the land and further liberties. 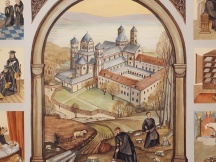 After Konrad I of Masowia had called the Teutonic Knights and their Grand Master Hermann of Salza against the heathen Old Prussians, a settlement movement - the so called medieval German settlement into the East (German Ostsiedlung)- began.